Modular Wine Rack Beechwood 32-96 Bottle Capacity 8 Bottles Across up to 12 Rows – My Home Wine Bar ! Amazon Price: $57.99 (as of February 3, 2019 6:20 pm - Details). Product prices and availability are accurate as of the date/time indicated and are subject to change. Any price and availability information displayed on the Amazon site at the time of purchase will apply to the purchase of this product. 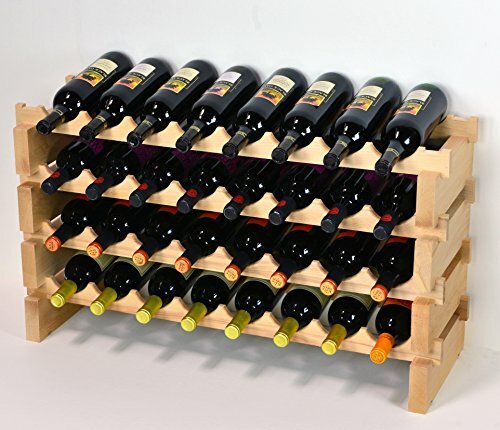 Hand made, solid hardwood, stackable modular wine rack of beautiful design and construction. Manufactured from the same quality beech hardwood used in making our furniture grade display cases. We use very high quality solid imported Australia beech wood for these racks. The wood we use is of superior quality over other wine racks found on Amazon. They are smooth yet durable material. You have the option to select these racks ranging from 32 bottles 4 rows all the way up to 96 bottles 12 rows. Based on your wine bottle capacity requirements. The pictures tell you everything, our stackable modular wine racks are the most versatile and easily assembled racking system available. We have multiple sizes of racks and lengths to accommodate your wine capacity as well as your floor space. We have racks ranging from 24 bottles to 144 bottles. All different capacity and lengths, to fully utilize your floor spacing.